The Radioactive Yak: No. Sleep. 'Til Stockholm! Ten events in seven cities across six countries in twenty-two days. The slides for "Being Epic: Best Practices for Android Development" are on SlideShare, and you can see me presenting them at GDD Prague. I also had the pleasure of co-presenting "HTML5 of Android for Mobile Development?" with Michael Mahemoff - you can watch the video and / or check out the slides for that too. It was a hell of a tour, filled with great events and incredible people. Starting with Yan, our host at C-Base and the man with the megaphone herding cats to successfully lead the Blinkendroid world record at GDD Munich. From Berlin we flew down to Florence - thanks in no small part to Andrea forcefully insisting that we hold an ADL in Italy. Francesca and the Firenze GTUG then took us out to an incredible meal (featuring 4 entrees) at a wonderful tratoria before we headed out for Munich and the GDD events. One of the most interesting aspects of doing so many events in close succession is learning what resonates best with different audiences. The best reaction I got was by imploring Czech developers not the be "Hovados". Explaining (in German) to the Munich attendees that my German was terrible, and as a result I'd be completing my presentation in English, seemed to get the crowd on-side. Moscow is always a highlight of any GDD trip - and we got the incredibly warm welcome we've learned to expect. A special thank you goes out to the folks at Andrstore in Russia, who provided the latest addition to my plushy Android collection (pictured above). We ended the tour at the Ice Bar in Stockholm, after Peter Svensson let us take part in a special Android themed GTUG event that was the perfect end to a long, rewarding expedition. 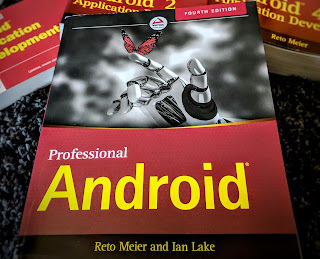 There will be more detailed posts on the Android Developer blog and Google Code blog, but for now I just wanted to say thank you to everyone who helped make this possible. From the GTUG organizers, to my fellow Googlers, and most of all the participants - you guys make the endless travel worthwhile. Thanks for coming out! I'm now heartily sick of my slides and it's time for some new material. So tell me, loyal Android developers, what would you like to hear more about? Let me know in the comments! If only one, my first choice is "hybrid apps with GWT"
It was very hard tip... ...almost every third day in the airplane? wish i could do the same things, just like you did! Love that you posted a Pic of your GTUG BootCamp Shirt and thank you for being there AND awesome. I would like to hear more about the topics from your last GDD Talk with @mahemoff, the future of Android and HTML5. Thanks Reto for your trip. Your visit to Stockholm was a really good motivation for me.